Turkish Delights are not very popular in North America unless you consider that they are the basis for applets and cot-lets. According to the Bekir Confectioners of Istanbul, Turkish Delights or lokum have been made since the 1500’s but it wasn’t until the 19th century that they made their way to Britain and the rest of Europe. No one seems to know the identity of the man who transported cases of lokum to England way back then, but he labelled the packages “Turkish Delights” and that’s how we got the name. They’re wildly popular in most Common Wealth countries. The original recipe was made with rose water, water and flour (starch). Most of the recipes I’ve researched still include starch (corn starch) as the binding agent. However, while living in Tonga, I used a common plain gelatin, the name of which escapes me and all the search engines, that came in one large envelope, in a box, and included this very simple recipe without starch. The cornstarch listed with the ingredients is added to the powdered sugar for dusting the finished product. Icing sugar, which is made with cornstarch and powdered sugar, is regularly used in Common Wealth countries, but not in the USA. All the recipes I’ve found use food coloring to dye the syrup. Naturally, I’m reluctant to put anymore chemicals into my system than necessary so I’ve substituted cranberry juice in place of lemon juice. 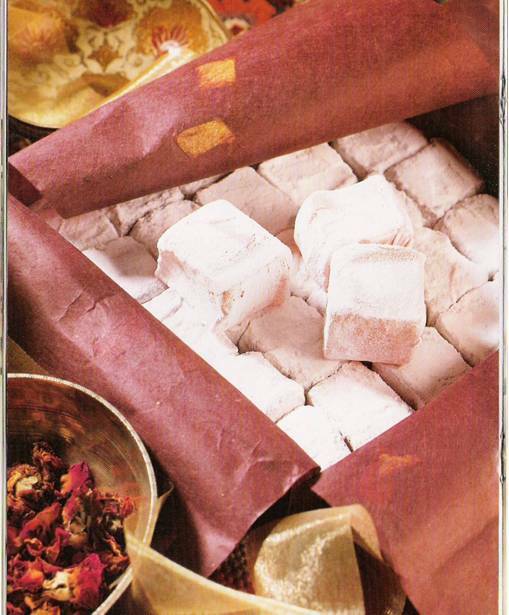 It gives the lokum just enough pink hue so you can recognize the rose water ingredient. You can use cherry juice, grape juice, orange juice, vegetables such as red beet, or roots such as turmeric to dye the syrup. This recipe is successful everytime I make it and makes a lovely hostess gift with some homemade truffles and espresso beans. In a heavy bottom sauce pan, bring water and sugar to a boil over medium heat. Soften gelatin in 1/4 cup water. Once the sugar syrup is boiling add the gelatin, stirring constantly. Lower the heat and simmer until syrup has reached the softball stage, about 20 minutes. Remove from heat, add juice and rose water. Rinse an 8X8 inch pan with cold water. It’s important to use this size pan to achieve a one-inch thickness. Sprinkle bottom of pan with pistachios and pour in syrup. Let cool at room temperature, then cover and set in refrigerator overnight. Combine powdered sugar with cornstarch. Place a sheet of parchment or wax paper on work area and dust with half the sugar mix. Use a thin spatula or knife dipped in the sugar mix to lift the edges of the candy, invert pan over the sugar dusted paper. Dust the top side and slice into one-inch cubes. Dust your knife with powdered sugar mixture to make slicing easier. Roll cubes in the remaining sugar, coating all sides, before storing. Store between layers of parchment or wax paper in an airtight tin in the refrigerator or in a cool pantry. I’ve been using this recipe for the last 20 years and it never fails to impress my guests. It’s from Jeff Smith’s book, The Fugal Gourmet – Our Immigrant Ancestors. The only thing I’ve changed is to substitute the red food-coloring with a sliver of red beet. Be sure to buy fresh young ginger root and wear plastic or rubber gloves when peeling and shaving the root. Otherwise, your hands will be on fire for the rest of the day. Use a potato peeler to shave strips from the root. This is a Japanese condiment used to cleanse the pallet between sushi courses and is served along with wasabi, takuan pickles and the like. Try it with pork roast, roasted chicken, or ham steaks. In a stainless steel sauce pan, place the vinegar, sugar, salt, and beet slice, bring to a boil over medium heat and stir until sugar is dissolved. Add the ginger, reduce heat to low and simmer for 1 minute. Remove beet slice once the ginger is lightly pink in color. Pack sterilized jars with the ginger, pour brine over and seal. When cool, refrigerate up to one month. Once you have your ginger pickles and daikon pickles made, plan a sushi party and include tempura veggies, hijiki seaweed salad, pear and saki sorbet, and almond cookies. Wash and peel daikon like a carrot. Make long threads of daikon on a mandolin or with a zester. Do the same thing with a carrot so you have equal parts daikon and carrot. In a small bowl whisk together 1 Tbsp rice wine vinegar (or any vinegar you have on hand), 1 tsp sesame oil, 1/2 tsp sugar, and 1 tsp soy sauce. Pour over the angel-hair daikon and carrot and toss lightly. This can be added to a master-piece Chef salad or your favorite green salad. 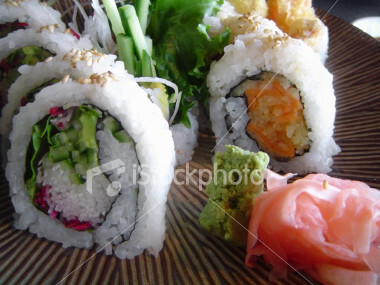 It’s crunchy enough for a sub-sandwich and of-course it can be added to a sushi box or sashimi plate. 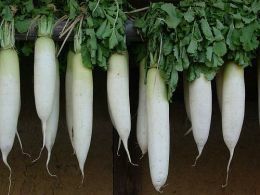 Daikon has amazing health benefits, such as digesting fats and as a diuretic, and you can get those facts on the web, just google daikon health benefits. This Japanese pickled daikon (called Takuan) is good with fish and meats and very simple to make. It’s usually yellow in color from the addition of yellow food coloring, however you can attain the same color with a small slice of fresh turmeric or 1/4 tsp of ground turmeric. Fresh turmeric is available at Asian markets and looks like ginger root. Once pickled, Takuan will keep in the refrigerator for several weeks and makes a great gift for foodie friends…add it to a basket of your homemade pickles. Pack sterilized canning jars with daikon. Boil all the brine ingredients until sugar is dissolved. Cool. Remove turmeric root. Pour over daikon in jars and cover. Place in refrigerator. 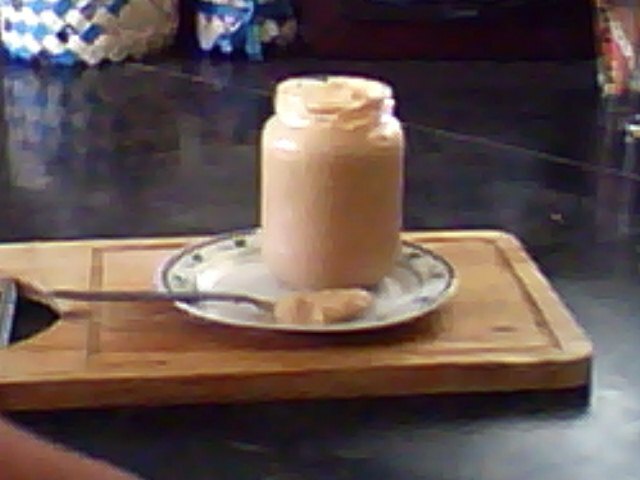 Shake jars occasionally. Pickle will be ready in about two days. Grandpa stewed dried prunes every morning before going out to milk the cows. He claimed they “kept him regular.” Prunes are simply dried small plums and they do aid the digestive tract. Preserved as a pickle they make a gourmet gift for any “foodie” and can be made anytime of the year. Cover the tops of jars with pretty callico and a ribbon. Add a gift card with this quick recipe. Cover prunes with boiling water for 1 hour. Drain and reserve liquid. Combine sugar, vinegar and 1/2 cup of reserved liquid with spices and simmer for 12 minutes. Remove cloves and cinnamon sticks, pack prunes in sterile jars and pour hot syrup to 1/2 inch from top of jar. Seal and water bath in boiling water for 15 minutes. Remove and cool. 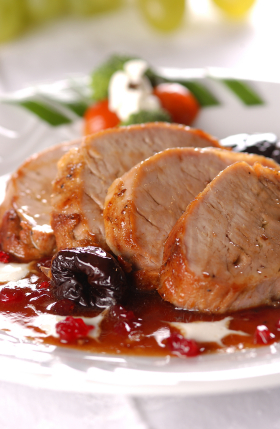 Serve with your favorite pork, chicken or lamb dish.